The whole purpose of a Squeeze Page is to obtain the contact information from the visitors who come across your page. What few new marketers or business owners even realize until it's too late is, not all Squeeze Pages get the same results. With many new marketers and home business seekers joining a home based business daily, there is often a squeeze page provided by the company they have joined. Now, this is where many inexperienced home business owners fail in home business right from the start. The majority of inexperienced business owners think that, this Squeeze Page provided by the company is all they will need to succeed and become a top earner. This could not be further from the truth. Reason, the Squeeze Page provided to you upon joining, is the same page given to thousands upon thousands within the same company. Over 95% who attempt to run a successful home business fail, do to trying to promote the Squeeze Page provided by their company. The odds are not in your favor, when you try to promote the exact same Squeeze Page as thousands within your own company. The result is, "competition before the competition". Meaning, you are competing with your own companies members, before you even go into competition with the thousands of other companies in the home based business industry. Hopefully you grasp the importance of this "NEVER use our replicated squeeze page" tip we are sharing with you today. Now we will go over the solutions to this problem. So now we know that you MUST have your very own Custom Squeeze Page. There are a couple of options in obtaining a high converting unique Custom Squeeze Page. You could hire a professional to design your page, or you could try and create one on your own by using cheap templates found all over the web. For obvious reasons, trying to create your own Custom Squeeze Page Design is NOT recommended. With your Squeeze Page being the most important page of your business by far, only experts in design should create such a page for high conversions. As a home business owner, your job is to learn how to market effectively and generate enough leads to fuel your business. You should not be spending your time on trying to learn how to design a Custom Squeeze Pages. Let professionals who are skilled in creating high converting Custom Squeeze Pages, design your page to avoid any mistakes on your behalf. There are many Squeeze Page Design companies to choose from on the web, so we will narrow down your options, so that you do not waste your time or money on ineffective services. Your page needs to be perfectly designed to covert time and time again, so that your leads and profits skyrocket, so we will only suggest the best to you. 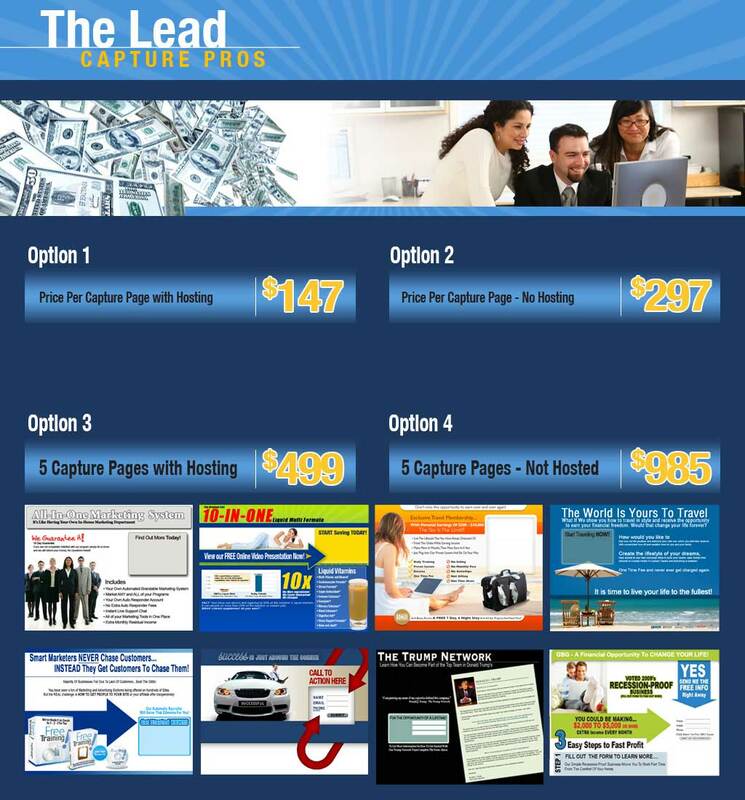 Once you have your very own Custom Squeeze Page Design, then you can fully dedicate yourself to what top earners try and master everyday, TRAFFIC. By having your own Squeeze Page, you will now have the ability to work all phases of marketing such as, SEO, Email Marketing, Web 2.0, PPC Marketing etc.. These strategies could not be possible if you were to try and use your replicated Squeeze Page provided by your network marketing company.